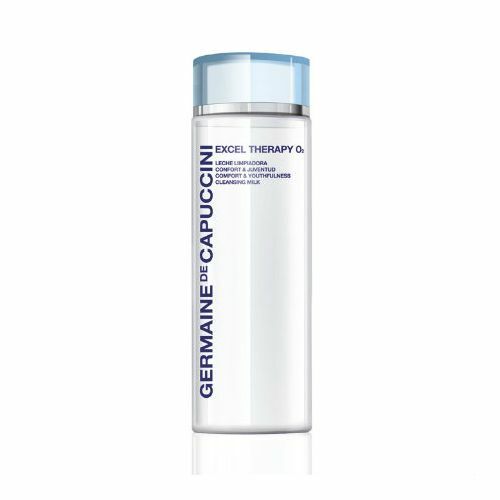 Exfoliate and feed the skin simultaneously with Germaine de Capuccini's Excel Therapy O2 365 Soft Scrub. This oxygen-infused facial exfoliator revitalises the complexion and helps to smooth-out fine lines and wrinkles whilst feeding the skin with one the most important nutrients - Oxygen. This gentle scrub is suitable for all skin types, and those with hyper-sensitive skin will benefit greatly as this soothing formula helps to restore the face's natural balance and protect newly exposed skin. If you're looking for a face scrub that packs a punch without upsetting the skin's natural state, Germaine de Capuccini's Soft Scrub is the one for you. Benefits: Improved skin tone, reduction in acne and blackheads, more youthful complexion, improved micro-circulation and reduced congestion. Buff the skin to perfection with the perfectly blended face scrub infused with Oxygen. Oxygen is vital for the skin to appear radiant and energised, it also helps the skin with it's natural processes, thus improving its overall well being. Excel Therapy O2 365 Soft Scrub clears out the pores leaving them more refined and free from oxidised dirt. Massage Germaine de Capuccini Excel Therapy O2 365 Soft Scrub onto the face with a little warm water. Rinse. Focus on the areas of the face that are most problematic; around the nose, the chin and the forehead. Love the Germaine de capuccini range. Gentle product on ageing skin. My skin felt clean and smooth after using the scrub but I found the perfume overpowering. Excellent product. Just waiting for it to come back into stock.